Whether you use Firefox, Internet Explorer, or Google Chrome, you may become the next victim of Content Defender. This program is published by Artex Management S.A. and signed by YUNITEKH SOFT, and it is possible that it will expose you to unreliable online offers. If you do not use ad-blocking tools, you must be used to seeing ads on the sites you visit, which is why this ad-supported program can work without much notice. What this advertisement-supported program can do is replace ads you typically see with its own ads. Even though interacting with online ads is always risky, the ads showcased by unreliable adware can be malicious, which is why you must delete it ASAP. Continue reading to find how to remove Content Defender from your operating system. The fact that Content Defender is represented as an authentic security tool and that it can inject potentially unreliable ads by replacing the original ones is very disturbing. We suggest removing Content Defender from your operating system as soon as possible, and, according to our research, you should be able to get rid of this threat by uninstalling it via Control Panel. If you have no idea how to uninstall undesirable software, please check the manual removal guide below. You also should not forget about the threats that could have entered your operating system along with this malicious adware. Whether or not you can remove these threats manually, you have to consider installing security software that, besides protecting our operating system, can also delete malware automatically. Move to the left of the Taskbar, click the Start icon to open a menu, and select Control Panel. 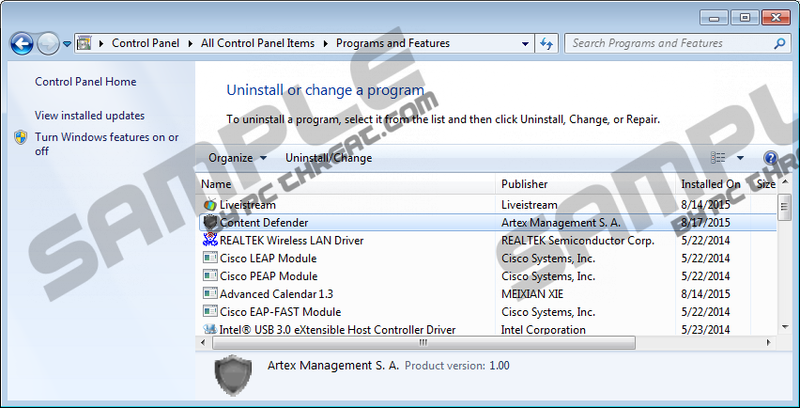 Double-click Add or Remove Programs and, in the menu on the left, click Change or Remove Programs. Navigate to the Taskbar, click the Windows/Start button, and open the Control Panel menu. Right-click the application you have chosen to delete from your computer and select Uninstall. Simultaneously tap keys Win+R on your keyboard to launch the RUN utility. Enter Control Panel, click OK to access the menu, and navigate to Uninstall a program. Identify the program you wish to delete from your computer, right-click it, and select Uninstall. Quick & tested solution for Content Defender removal.